Film critics across the country stood in solidarity with the Los Angeles Times after Disney blacklisted the publication. The Walt Disney Co. is ending its ban on the Los Angeles Times from press screenings after fierce condemnation from industry professionals. The company blocked the Times from Disney movie screenings after it published an investigative series in late September examining the financial ties between Disney and the city of Anaheim, California. That's where Disneyland and Disney California Adventure are located. It reportedly called the investigation "unfair coverage." On Nov. 3, the newspaper said Disney wouldn't let its employees into advance screenings of films like "Thor: Ragnarok" and Pixar's "Coco." Let's just say film critics weren't thrilled about it — movie reviewers and some other publications said they'd boycott upcoming Disney screenings in solidarity with the Times. 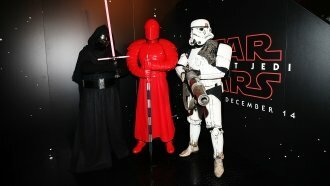 On Tuesday, the Los Angeles Film Critics Association, the New York Film Critics Circle, the Boston Society of Film Critics and the National Society of Film Critics pledged to disqualify Disney films from consideration for their year-end awards until the company lifted its media blackout against the Times. "Disney's actions, which include an indefinite ban on any interaction with The Times, are antithetical to the principles of a free press and set a dangerous precedent in a time of already heightened hostility toward journalists," the four groups said in a joint statement. And amid all that pressure, that's exactly what Disney did. The company said in a statement Tuesday that "productive discussions with the newly installed leadership at The Los Angeles Times regarding our specific concerns" prompted it to end the ban.